stars are balls of gas, mainly hydrogen and helium. nuclear reactions in the heart of stars, such as those in nuclear bombs, generate enormous energy, which the stars send out as heat and light. heart of a star reaches 16 million°C. a grain of sand this hot could kill someone 100 miles away. gas in stars is in a special hot state called plasma, which is made of atom stripped of electrons. in the core of star, hydrogen nuclei fuse (join together) to form helium – this nuclear reaction is called a proton-proton chain. Large stars are hot and white/blue, and smaller stars are cool and red. A large star can make energy faster and get much hotter than a smaller star. Medium-sized stars Sun, look yellow. stars twinkle because they are seem through the Earth’s atmosphere. 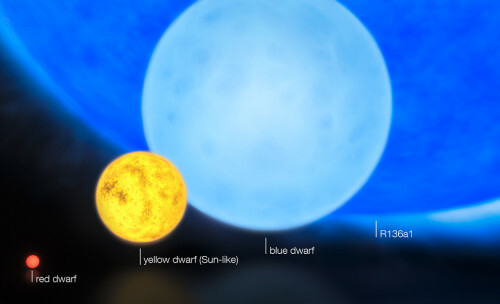 astronomers work out the size of a star from its brightness and its temperature. the size and brightness of a star depends on its mass – how much gas it is made of. The Sun is a medium-sized star. No star has more than 100 more times the Sun’s mass or less than 6-7 percent of its mass. the coolest star, such as Arcturus and Antares, glow reddest. the hotter stars are yellow and white. the hottest are blue-white, like Rigel and Zeta Puppis. the blue supergiant, Zeta Puppis, has surface temperature of 40,000°C, while Rigel’s is 10,000°C. This stellar swarm is M80 in Scorpius. 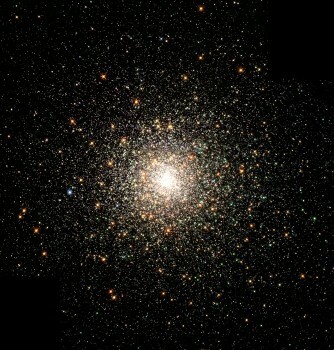 A swarm, or large cluster of stars known as Messier 80 (M80 or NGC 6093), from the Milky Way. This swarm, 28,000 light years from Earth, contains hundreds of thousand of stars, ‘attracted’ to each other by gravity.